Bob Boze Bell's Big Bad Book of Bad Diary Entries: A Murder of Crows In a Cornfield? Or Is It A Wheatfield? 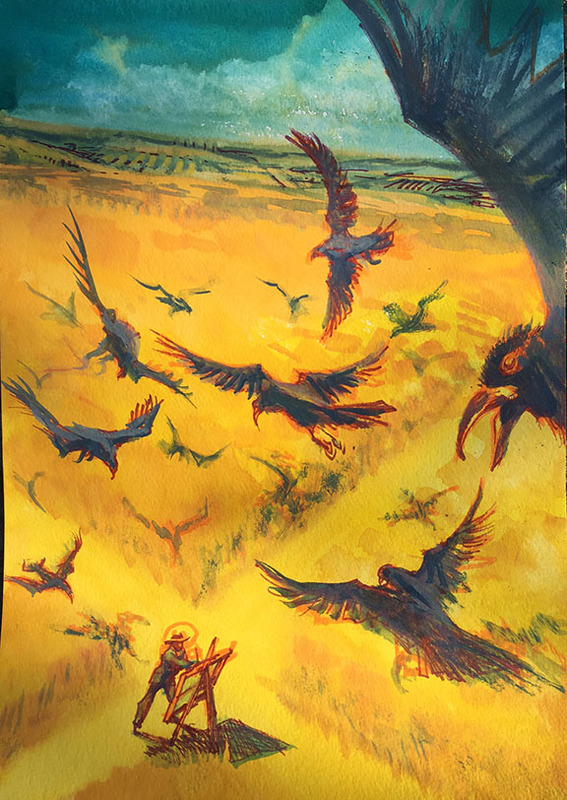 A Murder of Crows In a Cornfield? Or Is It A Wheatfield? Here's a mystery that just, ahem, cropped up. 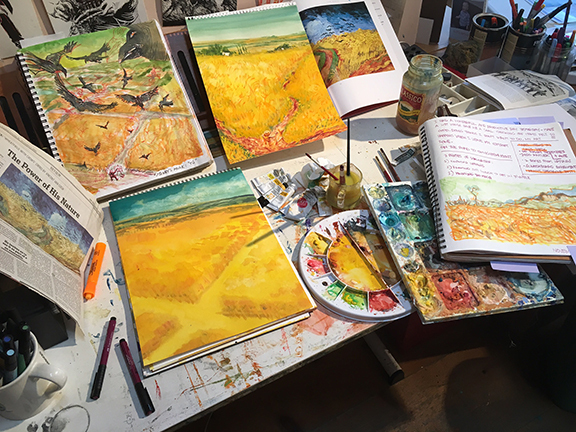 I'm doing an overview of Vincent van Gogh painting one of his last canvases in Auvers Sur Oise, known popularly as "Wheatfield With Crows." My goal is to view the scene from the crow's POV, as they circle down to harass and metaphorically "kill" the doomed artist. 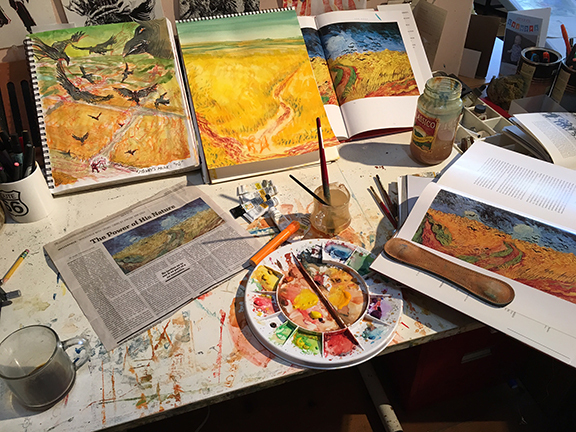 Only, when I looked up the painting for art reference (see book open, below), it says the painting is called, "Crows Over A Cornfield." So, what gives? A wheatfield looks quite a bit different than a cornfield and to my eye, the van Gogh painting is not a cornfield. Are there two paintings with different titles (van Gogh often painted multiple versions of scenes) or has the title "Wheatfields With Crows" overtaken the actual title "Crows Over A Cornfield"? Daily Whip Outs: "A Murder of Crows POV In Progress"
Daily Whip Outs: "A Murder of Crows In Progress #2"
Daily Whip Out: "A Murder of Crows"
A Happy Accident: the unintentional halo on van Gogh's head. Actually intended as his hat, but changed the angle of his head as it progressed and left the under sketch. "An artist's last canvas can hold a mythic place in his oeuvre. Vincent van Gogh's 'Wheatfield With Crows,' painted just days before he died by his own hand on July 29, 1890, and enshrined in the Van Gogh Museum in Amsterdam, long enjoyed such richly evocative stature. Its vivid palette, tempestuous paint stroke and visceral, engulfing composition—replete with ominous, advancing crows—led even the revered art historian Meyer Schapiro to describe it as the tormented Dutch painters's 'deepest avowal' and desperate last 'defense against disintegration.'" In British English, "corn" refers to any grain. What we call "corn", they call "maize". I think it's definitely a wheat field. Cool picture from the crows POV.